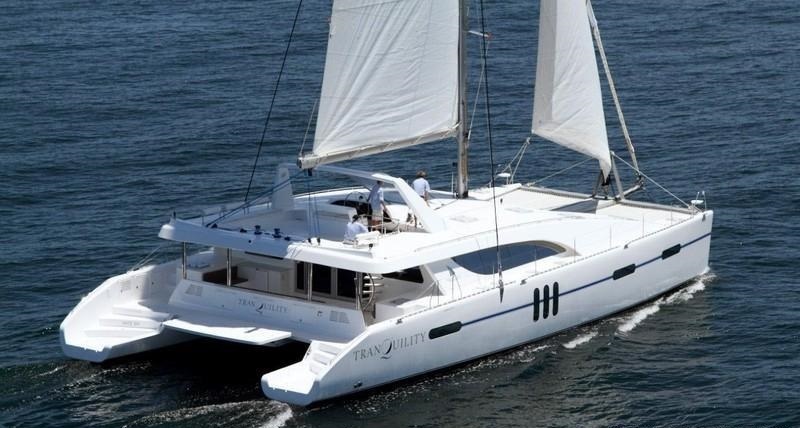 Luxury sailing catamaran TRANQUILITY is a state of the art Matrix 760 design launched in 2013, she boasts futuristic lines and measures 23.1m (76ft). 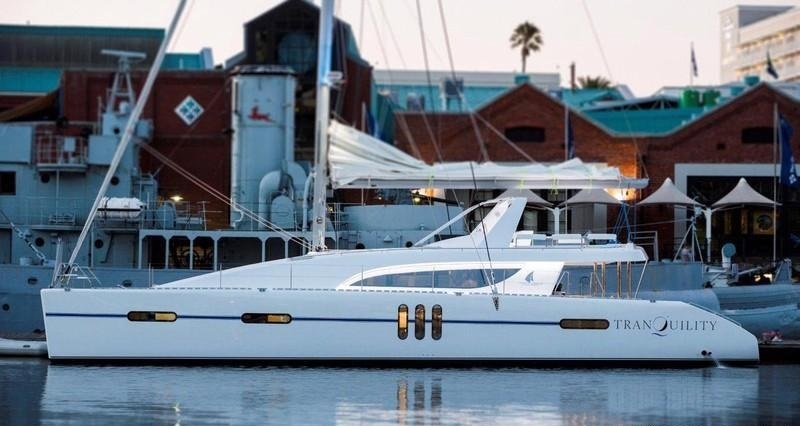 Sailing yacht TRANQUILITY has over 2100 square feet of deck space on her beamy 11.5m (38ft) decks, with similar indoor proportions of just under 2000 square feet, making the yacht the ideal choice for a Caribbean charter holiday. 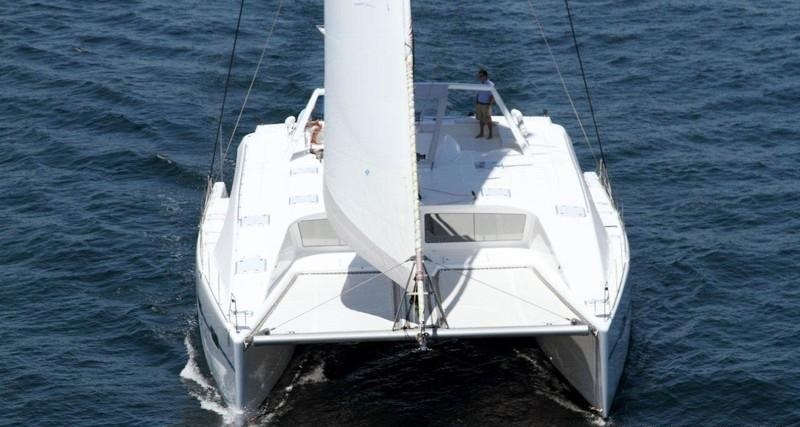 Catamaran TRANQUILITY can accommodate up to 12 charter guests in 6 en-suite cabins. 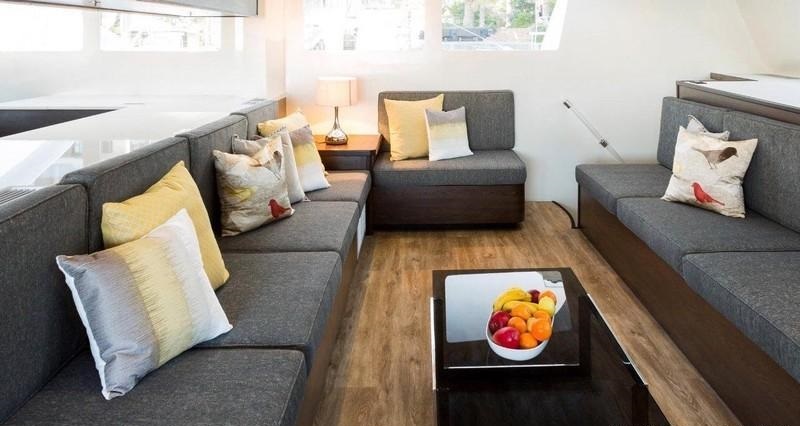 Performance cruising catamaran TRANQUILITY offers ample interior space. 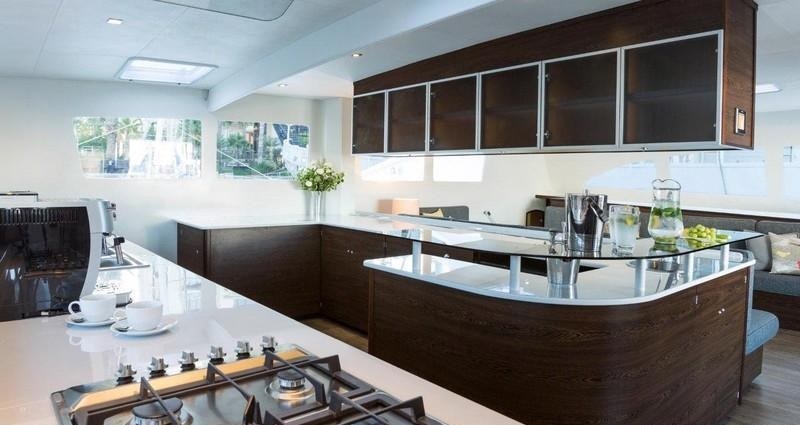 The salon and galley are an open plan on deck level, allowing for 360° views, ample light and an extremely social focus. Wide sliding glass doors open out onto the shaded aft deck, complete with alfresco dining option, ample seating and 2 double sunpads. 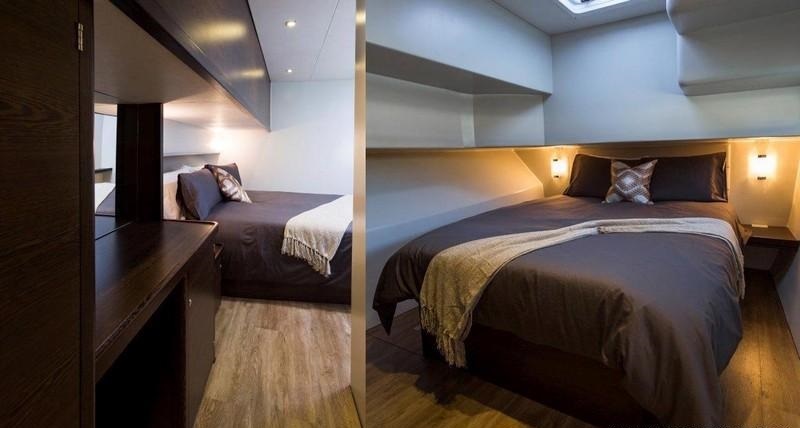 Guest accommodation is below decks in the port and starboard hull, featuring 4 double and 2 twin cabins. 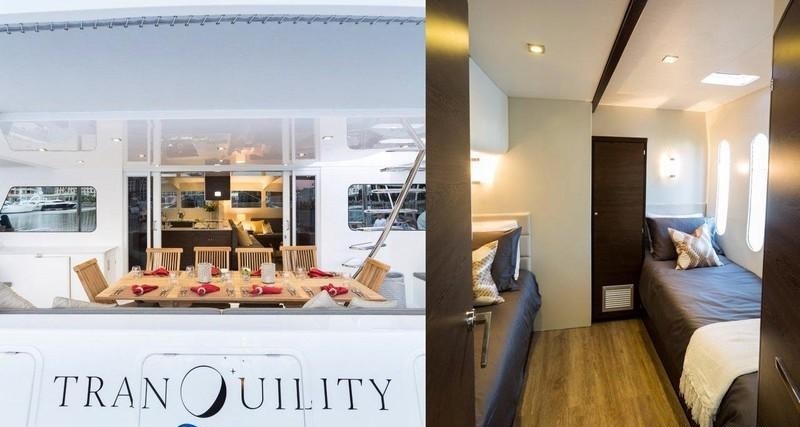 Exterior space aboard the TRANQUILITY catamaran is generous on 2 levels. 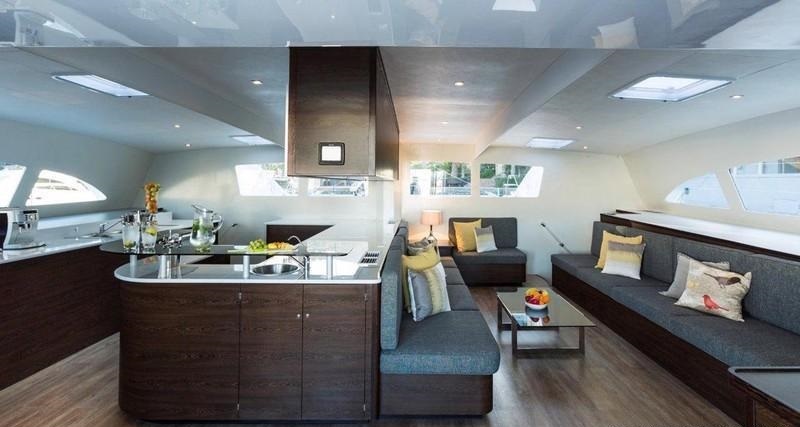 The aft deck is ideal for entertaining with ample areas to sit, relax and dine. Further aft, 2 wide sugar scoop transoms make water access effortless. 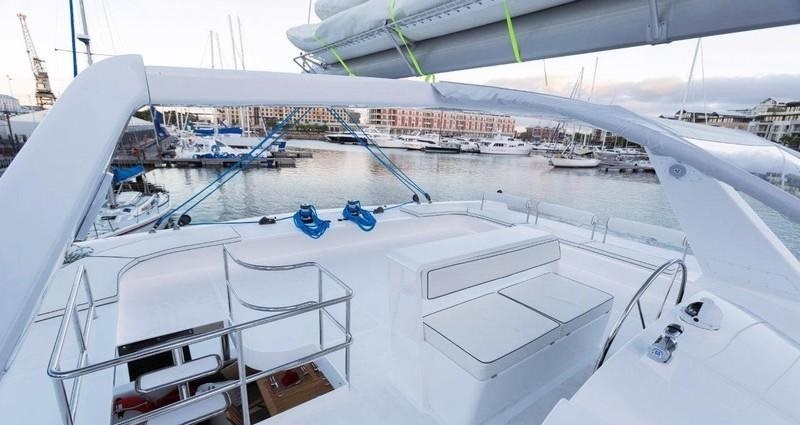 The foredeck provides plenty of additional deck space and 2 large safety trampolines, perfect for sunbathing with a good book. 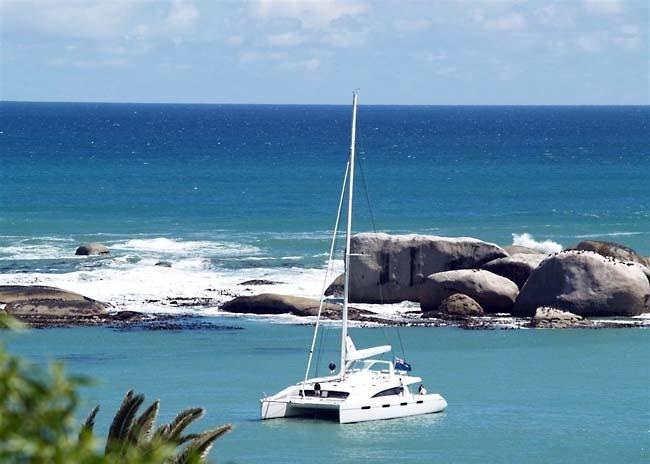 Above the main deck, the flybridge is generous offering loads of sunning areas, optional shade, seating and a mini hot tub. 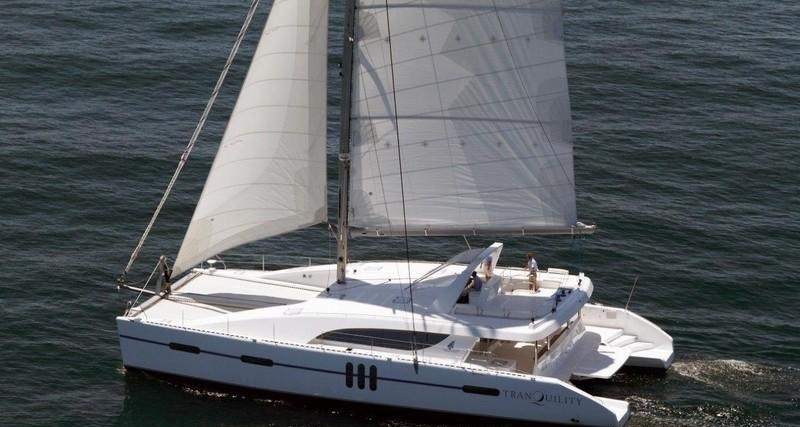 Charter yacht TRANQUILITY offers 6 en-suite cabins for up to 12 charter guests. The port hull has the master suite forward, with a queen size bed and ample floor space. A VIP cabin is aft with a queen size bed. 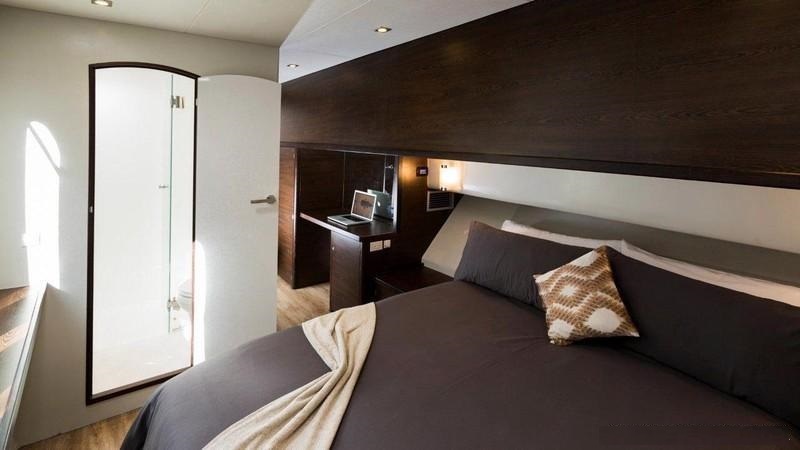 In the starboard hull, 2 double cabins are fore and aft with queen size beds. 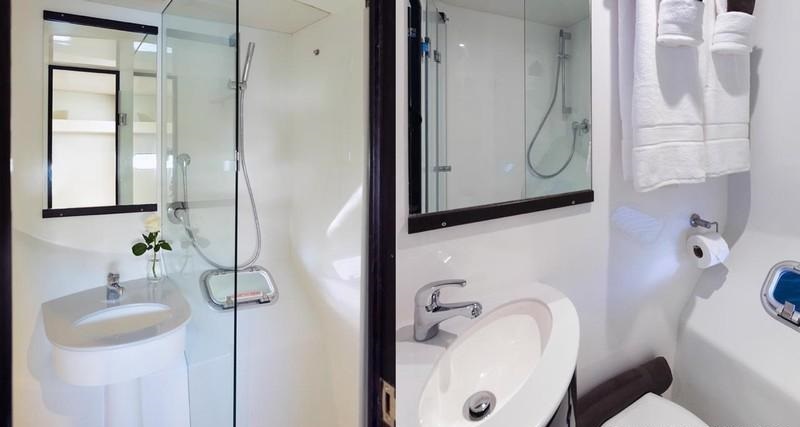 A further 2 cabins are centered in the starboard bull offering 2 twin berths each. 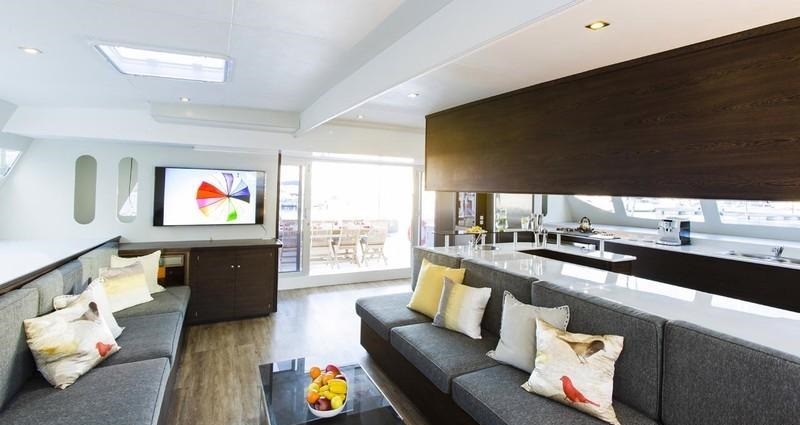 All 6 cabins benefit from plenty of natural light thanks to ports and hatches. 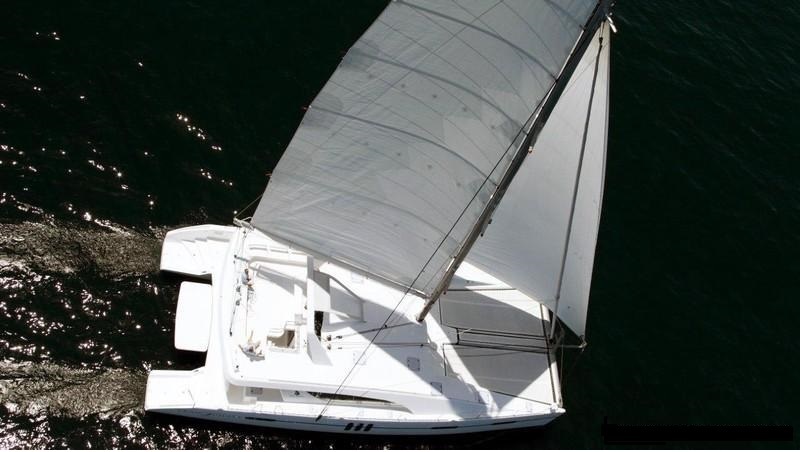 Sailing catamaran TRANQUILITY is fully air conditioned, for optimum comfort. 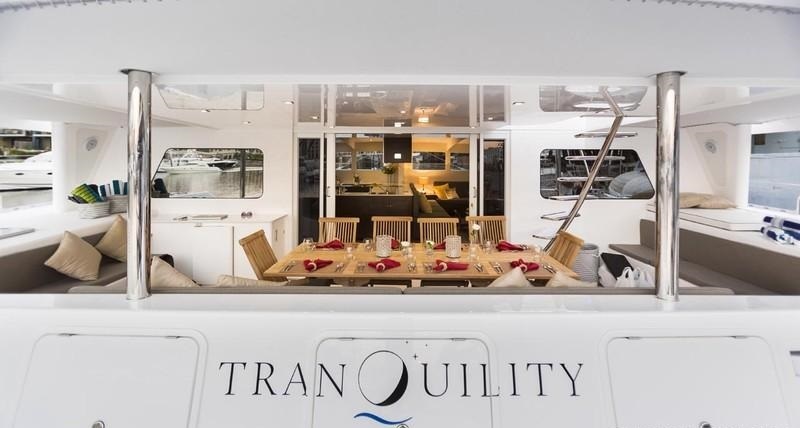 Yacht Amenities and Toys onboard the cat TRANQUILITY includes a Tender, Wake board, Knee board, Water skis, snorkel gear, fishing equipment.